Advanced Dungeons & Dragons, especially the 1st Edition, is a foundation for endless adventure. Although the Player’s Handbook and Dungeon Master’s Guide include plenty of rules on everything from a specific spell components to pulling off Call Lightning when a djinn (genie) is nearby it leaves a lot to the DM to improvise. This Behind-the-DM Screen article shares some of my thoughts on the situations our party encountered in Episodes 1-5 and elaborates as to why I feel these were fast and fun ways to enable player action. Players LOVE to be creative especially with their character actions. Leaping up onto a Hill Giant’s bed so you can do an overhand right on the left orbital, pushing a 250 pound iron-bound door of pine logs across a filthy, wet, stone floor with zero scraping sounds, making leadership decisions, and even, self-confidence checks? These are character actions and dramatic moments we love in books and films – and they should be in everyone’s game. Here are some of my rules on these. I’m no expert, but here are some of my takes on these checks as a DM in our recent episodes. In the 1st Edition, 12” means 120 feet in a ROUND. A ROUND is 1 minute, divided up into 10 equal SEGMENTS of 6 seconds each. I compress and expand the meaning of ROUND based upon what’s happening. You will hear me say ROUND a lot. It keeps it simple. Party engaged in combat, fighting, or moving. ROUND means 6 seconds. 3d6 for both sides, high roll wins (Goes first.) Unmodified for groups and when everyone is first starting a combat sequence. Later on, after multiple exchanges and if there is a 1 player character vs a single or low target count, sure, then use the Reaction/Attacking Adjustment (see Dexterity in 1st Edition PHB p. 11) Someone slip, fall, roll a 1? Reroll as these are melee resets. In the Steading of the Hill Giant Chief, I use different checks. A 25% chance per character on opening a huge heavy, 5 foot wide and 10 foot tall, 200 pound timber door without making unnecessary scraping sounds. First, you need characters that actually have strength to perform this. Assuming they could move or budge the object, and then it’s a sense of collaborative motion, I pull, you pull, we both brace our stance, balance, as if we’re the movers trying to not scrape that wooden floor with the piano that has metal wheels. In this case, 2-character effort, I use a percentile check 25% per character for 50% to be successful. A failure (a roll of 51-100) means they did it, but they caused an odd intermittent noise, such as CLUNK! This is a fun reward for players thinking about their actions intelligently. They are imagining they are there and improvising. I love players like this. Players that say things like, “I open the door,” when the door is out of the ordinary, such as the ones in the Steading of the Hill Giant Chief, are a bore. Players should think about how to open these things. For one player, especially a Dexterity-based class, such as Thief, Assassin, or Monk, I’ll do an ability score check. For example, in Episode 4 – “Not Just the Hill Giants Involved,” Elafonissi and Vaeringjar attempt to slowly push open one of the Hill Giant-sized doors. They wanted to do this as quietly as possible, making no noise, and only push the door far enough so the they could hide in shadows and slip inside. In this case, I feel their Dexterity is the true test. I rolled a d20 for each, and all they needed to do was roll under their Dexterity. With each having 17 Dex, they each had an 85% chance pull this off. If one failed but the other succeeded, the noise might be half as much. 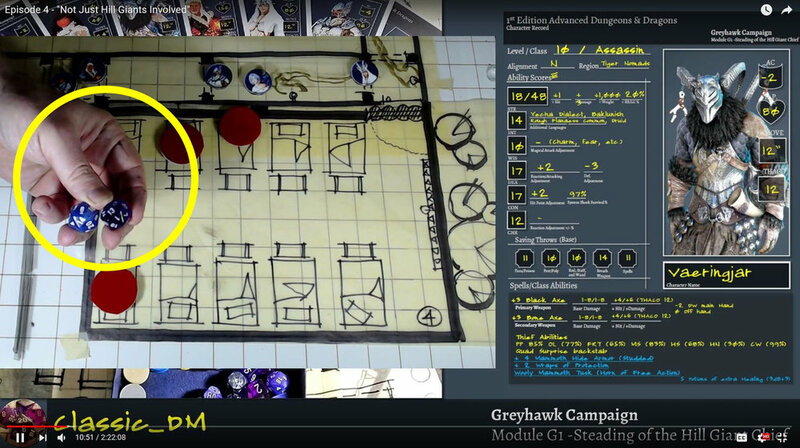 If they both failed, maybe a loud clunk, but in episode 4, as they snuck into the Hill Giant Sub-Chief’s bedroom (Room 2 in the original module) into here, they both easily succeeded. Tension is the key for players. They have classes with specific abilities. Let them highlight their skillfulness and reward them for their character’s prowess statistically! Player rolls. The lower the percentile roll (d100) the better. Toss in bonuses for using actual shadows and having a sense of comprehension of how shadows cast as the human body moves near or away from light sources. Unnatural motion (shadows moving) triggers a second look, even in the stupidest of Hill Giants and Ogres. Hide in shadows is not stealthing up like in World of Warcraft or crouching in Elder Scrolls Online. It means actually using the light levels in the environment to conceal yourself. Even at level 10, both Elafonissi, the Tiger Nomad Monk and Vaeringjar, her older brother, the level 10 Assassin, both have 30% Hear Noise chance. What exactly happens when a player tries to hear noise as a Thief, Assassin, or Monk? The player stands still, controls their breathing, and listens intently, focusing on blocking out the sound of their own heartbeat in their inner ear and the sounds near them. Perhaps they are trying to detect a sound beyond a wall, behind a door, or echoing down a hall. Identification is what the check is about. You don’t “fail” a hear noise check, the success or failure is how much information you get, its detail, and reveals how well you can confidently explain or identify the sound source(s). Behind the door are the sounds of 3, maybe 4 women cooking. The occasional clang and bang of pots and pans, scrapes of knives, sizzling of oil, and in the background multiple pots full with boiling liquids. A crackling fire with grease drips, and typical social chatter about food preparation, complaints about how long the pork is taking and so on. You hear a few scrapes and shuffling of feet and perhaps a faint bubbling sound with the crackle of flames. For a non-Thief, Assassin, or Monk, roll a Wisdom and Intelligence check (Ability score or less on d20 or 3d6 depending on how hard you think it is) but use on-the-spot judgment. Get on with the fun. Don’t give away subtle nuances to random characters thinking their Paladin is a skillful stealth class, but give them something fun to work with. Reward the player for being smart, tactical, and making successful rolls, just don’t give them the farm. Everyone rolls a 1 from time to time. I call this a FLUB. A flub is the absolute worst thing that could have happened, despite everything else. On a d20 it’s 5%. That’s a lot higher than you think. In some scenarios, I make players do a d20 roll to see if they can pull off a heroic action. For example, in Room 4 in Episode 3 – “The Back Halls,” near the end of the episode. Of course, she rolled a natural 20 - a complete FLUB. She slipped on her first step busting her shin on the bedrail, and made a sudden noise, cancelling out her entire maneuver and dropping her move silent concealment. Think cat video blooper. I gave the Hill Giants, drunk and asleep, a chance to hear this THUMP. Rolled a d20 for each Hill Giant and gave them a 5 or LESS (25%) chance to hear the sound and react to it. This could have also been a percentile die roll, but that means 6 die splashing across the glass. It was easier and faster to get on with it using a percentile check on a d20. Roll this as a roll to hit, but use a modifier. I call it a “Grab Check” with -5 modifier. For example, one of the Hill Giant Nursemaids in Room 5, The Maid’s Chamber, tried to grab Mercede. THACO for the Hill Giant was 14, so against Mercede with AC -2 she’d need a base 16. But with an additional -5 penalty she’d need a 21, but as with all d20 mechanics, no matter what, a 1 always misses and a 20 always hits and does double damage.